Centrifugal pump is an ideal equipment used to provide power for densander, desilter, and jet mud mixer. It can be also used as feeding pump ,slurry pump. 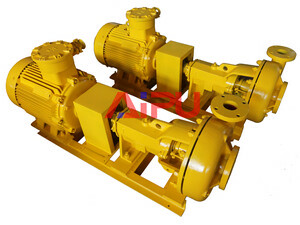 Usually, centrifugal pump is called sand pump as well. The centrifugal pump produced by Aipu solids control is designed based on studying a large number of domestic and foreign famous brand centrifugal pump. Adopted mechanical seal technology and better design. Aipu produce the pump with reliability, large flow, long service life, low consumption, easy to install and maintain and other advantages. The basic component of centrifugal pump: a standard motor, spindle, expansion couplings, converters, backboard, impeller, pump case and shaft seal. Solids control sand pump is a power source for desander, desilter, cyclone mixing device and etc. Tungsten carbide mechanical seal, good effect, without regular maintenance. The design of the impeller reduces axial thrust load. Easy to operate, repair and maintain. Use more thick pump shell, passage shape is more reasonable, the turbulence is reduced to the minimum than conventional ones. All bolts, nuts, flat washers, cotter pin galvanization processing, but do not contain chromium plating, nickel plating, pin do antiseptic treatment. If you need centrifugal pump or you have any other questions , please feel free to contact us. We will give you a optimal solution at reasonable price.